We are looking forward to 2019 as the year in which grow Baby Buddy content to support families for longer; recognise the needs of fathers; and work even more extensively inside the communities that need us most - to digitally empower them and help them to build their knowledge and confidence to be able to give their children the best start in life. We want to thank everyone who has supported us during 2018. Without your generosity, none of this would be possible. Please consider a Christmas gift this year that supports parents and might put a smile on a baby's face somewhere in the UK. WE WILL SEND A SPECIAL SOMEONE AN E-CARD ON YOUR BEHALF! 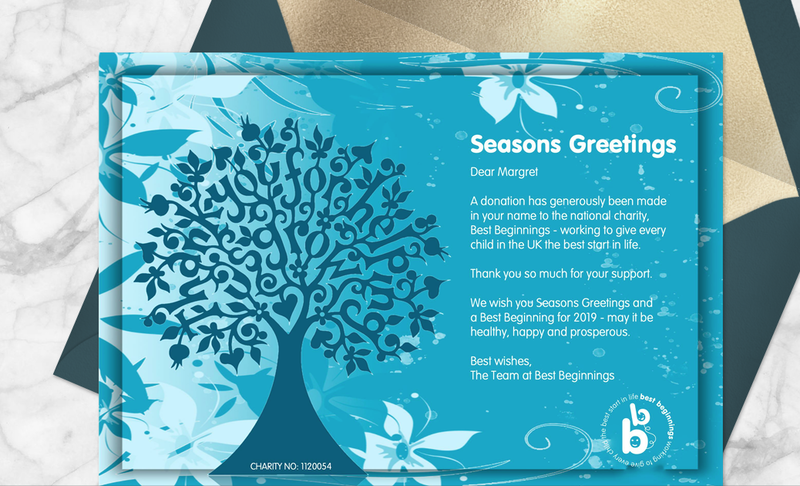 If you would like to make the donation in someone's name, we will send a heartwarming digital festive greetings card either to you to forward or directly to them (the card will look like its come from you). Rest assured that if you share their details, they will not be stored and will only be used for this purpose. For each donation, we can send a maximum of 4 cards. Click here to fill out the e-card details. Raised through sales of Mama Notes. Thanks for all you do!